Nonprofit D.C. Central Kitchen runs a program that addresses these problems. The Healthy Corners program uses a $300,000 grant from the city to regularly deliver fresh produce to corner stores throughout D.C.’s food deserts. Nine of the participating stores are in Ward 8. 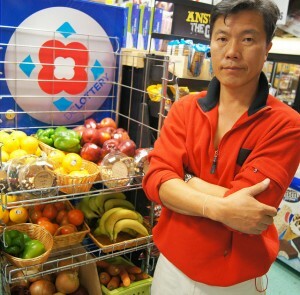 But rather than just focus on the lack of health foods in such stores, Barry singled out Asian-owned stores. By bringing highlighting race as an issue, Barry took the discussion beyond pure economics. So did a number of callers to The Kojo Nnamdi Show who complained that Asian retailers are rude or treat customers poorly. Cha said that not all Asian storeowners have bad relationships with the community, such Martin Luther King Grocery’s Peter Cho (whom, coincidentally, Barry referred to as “a good Asian” over the weekend). Cho runs a regular back-to-school event in Ward 8, giving away backpacks to neighborhood kids. He also participates in Healthy Corners. One thing Cha does suggest: if you want to see a different kind of product in your store, such as multigrain bread, try asking the store owner to carry it. “Any time there’s a dialogue going back and forth, it helps,” Cha said.